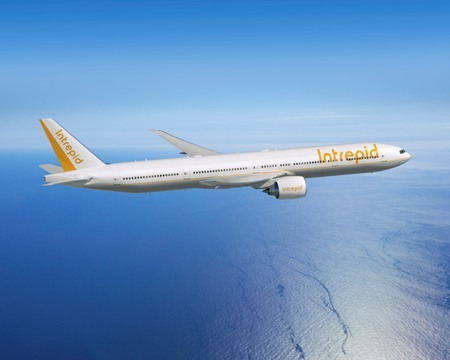 FARNBOROUGH, United Kingdom, July 15, 2014 /PRNewswire/ -- Boeing (NYSE: BA) and Intrepid Aviation today announced the leasing company's first direct Boeing order for six 777-300ERs (Extended Range), valued at $1.9 billion at current list prices. Pictured here, the 777-300ER in Intrepid livery. Intrepid also has the option to purchase an additional four 777s. If all options are exercised, the value of today's announcement could reach more than $3.2 billion at list prices. "The economics of the 777-300ER are outstanding and offer an attractive growth potential for our airline customers," said Franklin Pray, Intrepid Aviation president and CEO. "We are pleased to work with Boeing and add this order of the most popular twin-aisle aircraft of all time to our existing fleet of 777-300ERs." "We are excited to add Intrepid Aviation as a new Boeing customer," said John Wojick, Senior Vice President, Global Sales and Marketing, Boeing Commercial Airplanes. "This significant commitment to the 777 reflects their position as a leading widebody lessor providing airlines with the most modern and fuel efficient aircraft available today. The 777-300ER has a diverse and large installed base offering market-leading customer breadth and depth." Intrepid Aviation is a privately held commercial aircraft lessor, which owns commercial aircraft leased to airline operators worldwide. Intrepid Aviation focuses primarily on twin-engine widebody equipment, such as the Boeing 787 and 777.